Once you have the basic wreath instructions you are on your way, just add your own design and colors and you are good to go. With a few simple directions you will see how easy most wreaths can be to make. 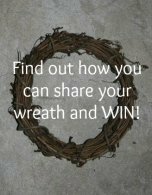 Most wreaths start with a wreath form of some kind for your base on which to work. Then depending on the type of wreath you are making you build from there. It is a good idea to have all your supplies when you start to make your wreath or you will have to stop mid-stream to go and get what you need to complete. So pick out the wreath you want to make gather your supplies and go for it. If you can glue it or tie it, it can probably be used on a wreath. Keep your eyes open at all times. After the holidays you can pick up bargains for next year’s holiday wreaths, especially ribbon. Keep your eyes open all year around as I just picked up some beautiful butterflies in the Christmas isle decorations that will be perfect for a spring wreath. Watch for sales and clearance items. Found a wreath stand at our local craft store. Perfect for wreath displays in other areas other than the front door. Practical and beautiful. Makes a great gift for any mother to be. Fun gift for almost any occasion. Takes some time but beautiful baby shower wreath. Living wreath to hang in a sunny spot. Soft and light, perfect for baby. You will be surprised how easy this is! Fun for any occasion. Just pick out your favorite ribbon.